My daughter had to present a how-to demonstration to her 3rd grade class. She found the idea for Mr. Grassias (as she named him) in the book I Can Make That! 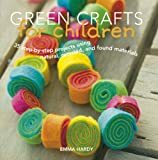 : Fantastic Crafts for Kids by Mary Wallace. The Grassy Head is an easy and green craft project for an elementary aged child. You'll probably have most of the items needed already, and it's an opportunity to reuse and repurpose old socks. It's an ongoing project, so it doesn't end after the glue dries. My daughter loved watching it everyday. First to see when it would start sprouting and then to see how high it would get. She was also eager to water it every day. Fill the end of your sock with potting soil. Leave plenty of room at the top to be able to close it later. Form the soil filled sock into a round head shape. Gather sections of soil on either side to make ears and wrap rubber bands around them. Gather a section in the front to make a nose and wrap a rubber band around it. Add grass seed at the top of the head, and then close it with the twist tie. Trim off the top of the sock. Glue on googly eyes and wait until it dries. Soak the stocking head in water for a few minutes. Place the head in a small bowl and leave it in a sunny spot. Add water every day and watch for the grass to grow. Trim it however you want or leave it long. If it were my little guy I'd have added a mouth. Either drawn on with a marker, or had the sock positioned so the seam would be the mouth. I might also have used a sock made of thinner thread and maybe another color. I noticed the Grass Head pictured in the book had the gathered/tied portion more towards the back, not centered on top of the head. The one in the book also had glasses made from 4 twist ties. I Can Make That! : Fantastic Crafts for Kids is filled with creative craft ideas that kids will love. There are sections focusing on costumes, puppets, toys, games, and more nature crafts. I particularly love the Enchanted Castle, Stone Statues, Bunny Buddy, and Eensy Weensy People. Have you ever made a Grass Head? This is such a great project for kids. I have four of them and this will definately be on the list of project to do. Thanks for sharing. This hilarious grass head sock doll is truly a fun, green craft for kids! I'd love to make these with my grandchildren. Saving this idea for sure. Cool! Mr. Grassias has so much personality. I love him. And your tutorial is crystal clear. Great craft ideas.Love the grass head. Can I make one? Please! This grass head is too cute and I do have the occasional old sock available. I might even age one, extra for this project. Hmmm...can you do this with chives? Or curly parsley?